Recently, I participated in a three day Saké Immersion Course in Las Vegas. John Gauntner, considered the foremost international saké expert, guided our 65-person class through every corner of the saké world. After tasting 90 different sakés, I came out with a new found appreciation for my go-to drink with sushi and perhaps now with other cuisines as I recognize its great versatility. I thought I would list some little known facts about this historic yet modern beverage to de-mystify some of it. 1. Saké is brewed, not vinified. I’ve often been guilty of calling saké “rice wine” and as of this week, I will no longer make that mistake. Rather than a simple sugar to alcohol conversion, saké goes through a process called “multiple parallel fermentation,” where the starches covert to sugar and the sugar converts to alcohol concurrently in the same tank. The result is that saké has the highest alcohol content of any non-distilled beverage in the world. 2. The most important ingredient in saké is a special mold. Just like our favorite cheeses, the most important aspect of saké production is the addition of rice that has been populated with a unique mold. 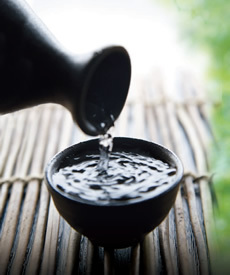 “Koji,” or mold-innoculated rice gives saké elegant aromas and flavor profiles, determined by the style the brew master (or “Toji” in Japanese) wants to achieve. 3. Premium saké isn’t made with just any rice. Just as there is a difference between the grapes at the grocery store and the grapes pressed at a winery, saké rice is a highly regarded aspect of saké production. Variations are created all the time, but because the outer shells of the rice grains are milled away, saké rice has been bred to have a centered kernel with higher than average water absorption abilities, so it dissolves easily during fermentation. 4. Premium saké is a world all it’s own. More than likely, the saké you order drink with your unagi roll and drop into your beer is a lower grade beverage called “futsu-shu” or table sake. It doesn’t mean it isn’t enjoyable or delicious, but if you’re looking to up your saké game, go with saké labeled minimally “Ginjo.” Ginjo is a level of saké that means the rice was polished to a finer level than table sake; and typically also means the production methods are of higher quality and apply more attention to detail. Gingo sakés are also required to use saké rice exclusively, while table saké has no such requirement. 5. Saké isn’t just for Sushi. The biggest takeaway from the course for me was developing my palate for saké and finding out what I liked and disliked. Each region in Japan has its own style, and they all lend themselves to various types of cuisine. Additionally, an impressive array of premium sakés are being produced here in the United States using traditional methods and high quality ingredients – the outcomes are extremely unique and delicious. We tasted several of SakéOne’s fresh, fruit forward Junmai Ginjo brews and found them to be stylish takes on the 1700 year old beverage. I found myself drawn to the ginjo sakés made in what is considered the southern style. The mouthfeel is more round and the nose had more pronounced tropical and waxy qualities. They had some vague similarities to Riesling and Viognier and I started to think about pairing them with cheeses, grilled meats and mushroom dishes. So take a chance and explore saké! It’s a unique drink with a fascinating culture and tradition. You won’t be disappointed.